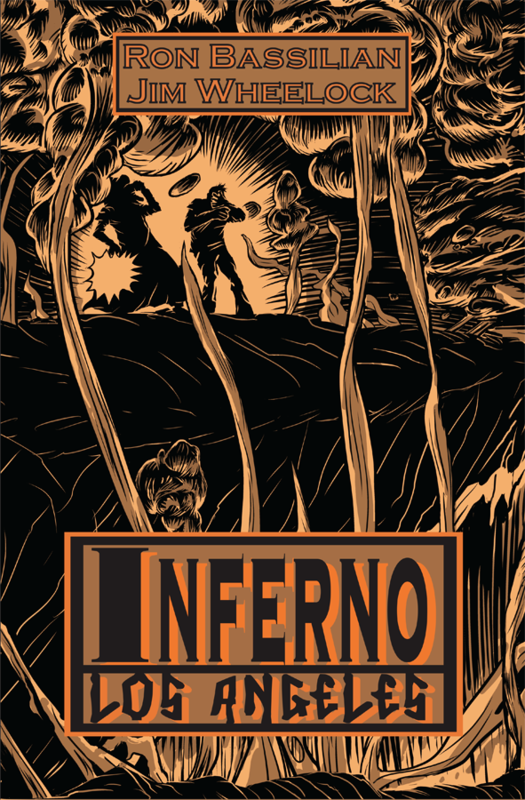 Cover page to the venerable graphic novel, Inferno Los Angeles. Over 700 years ago, the poet Dante Allighieri found his way to the Underworld from the dark wood outside his native Florence, and the adventure he recorded in The Inferno still haunts us to this day. Now, in modern times, a new traveler finds his gateway to Hell beneath the urban jungle of the “City of Angels”. Inferno Los Angeles revisits Dante’s journey, weaving new characters and contemporary scenarios with the timelessly familiar scenes Dante described. It is an adventure of pure imagination, fraught with obstacles, monsters, horrific visions and prophecies — all visualized in an epic graphic style. Journey with him, as each step down this human whirlpool brings new dangers and monstrosities, as we delve ever deeper into the torments of our own minds. INFERNO LOS ANGELES is a 136 page, full color graphic novel published in a deluxe over-sized hardcover edition by NeoClassics Press.